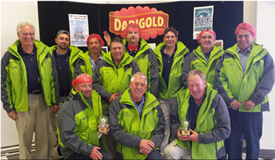 Continuous improvement is the framework for what we do in our processing operations at Darigold. This ethic is certainly critical in relation to quality and productivity, and it is no less important in our approach to environmental concerns. Our supply chain – including packaging, logistics planning and transport of raw materials and finished goods – is a big part of our environmental impact. Over the past four years, we have continued improving our performance in these areas and thereby reducing our environmental footprint. We believe in investing in people, systems and technology to drive environmental progress. From hiring environmental managers to investing tens of millions in environmental infrastructure, we’re providing resources for environmental improvement. 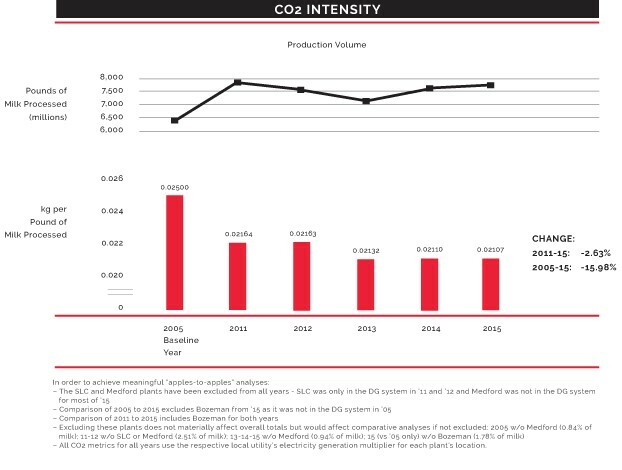 We have reduced our carbon footprint intensity by 2.6% over the past four years and by 16% since our baseline year of 2005. From energy conservation to reductions in waste, we strive to reduce our environmental impact each year. We have faced a range of operating challenges over the past several years, but our commitment to continuous improvement has helped us confront them. In 2015, we used nearly 3 million gigajoules (GJ) of electricity and natural gas – 2,966,440 to be exact – to process 7.7 billion pounds of milk. Given this scale of energy consumption, our efforts at conservation and efficiency improvements play a key role in the important work of shrinking our carbon footprint. In addition, we consume nearly 800 million gallons of water and produce more than 1.3 billion gallons of wastewater, so our water conservation work is similarly critical in reducing our environmental footprint. The short story of the past four years since our last CSR report is that we have continued to devote considerable time, effort and resources to environmental improvement, and because of that we’ve achieved even further progress. 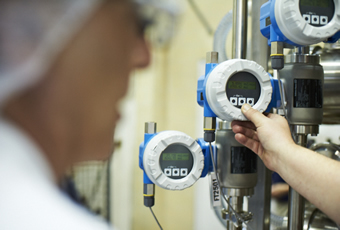 At the same time, we have confronted and struggled with several major challenges that are inherent to our industry (for example, extreme differences in the energy consumption of various product mixes and processing technologies, large changes in volumes, and significant shifts in customer demands). Although we have in fact improved our operating performance, these challenges have often made it more difficult to illustrate that with a simple report of steady improvement results. 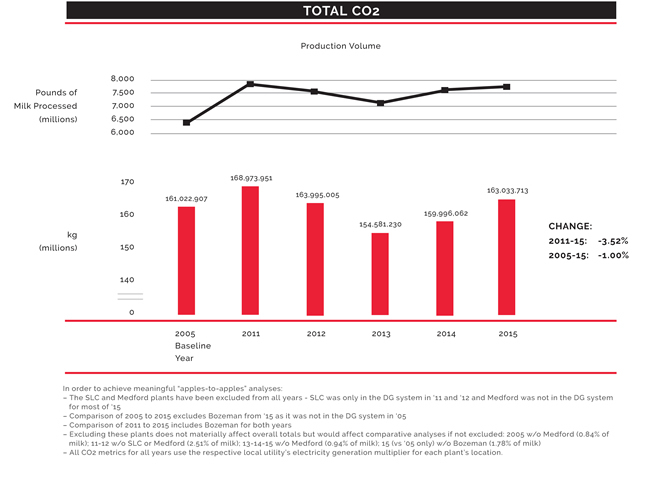 Beyond our recent performance, at the “big picture” level, since our baseline year of 2005, we have reduced our energy consumption and carbon footprint substantially. We used a total of 2,966,440 gigajoules (GJ) of energy in 2015: 77.27% from natural gas and 22.73% from electricity. Every plant is audited every year across 19 major categories for how well they have implemented the specific behaviorally-anchored elements of our energy program. Scored on a scale of 0 – 100, our plant teams have improved their performance each year. To help drive our environmental improvement efforts, every Darigold plant has a full-time dedicated Environmental, Health & Safety (EHS) manager. These professionals, with advanced degrees and specialized technical experience, assure a consistent focus on environmental compliance and improvement. Electricity makes up nearly one-quarter of our total energy consumption, with natural gas accounting for the remaining slightly more than three-quarters. Together, they account for more than 90% of all our carbon emissions. Over the last four years, we have developed a sophisticated energy conservation program that is now fully operative at both our corporate level and in every one of our plants. We have an energy team in every plant that drives the energy conservation efforts at their site and each team’s leader also serves as a member of our Darigold corporate-wide Energy Team. The corporate Energy Team meets every two weeks and leads our overall energy conservation initiative, including convening training programs (e.g., awareness, conservation and efficiency techniques, and team problem solving skills), arranging internal and third-party audits of both energy performance and energy management program efforts, designing our energy reporting system, and overseeing our regular, high visibility recognition and celebration activities. At each local plant site, the energy teams share weekly communications and conduct monthly meetings, track daily and monthly energy performance reports, lead their Plant Energy Improvement initiatives, support focused improvement projects, coordinate partnerships and leverage incentives with utilities, and help maintain visual control boards.  Our Energy Management System itself is closely modeled after the ISO 50001 Global Energy Management Standard. Our Energy Program assessment, conducted annually at every plant, consists of 19 major categories of performance where detailed behaviorally-anchored metrics are assessed and scored. 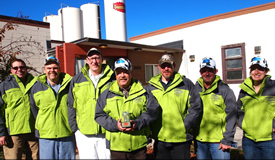 THE BOZEMAN PLANT ENERGY TEAM ACHIEVED THE GREATEST REDUCTION IN ENERGY INTENSITY IN 2015. 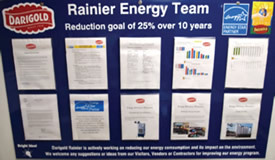 THE RAINIER (SEATTLE) PLANT ENERGY TEAM’S ENERGY VISUAL CONTROL BOARD. THE SUNNYSIDE PLANT ENERGY TEAM EARNED THE HIGHEST SCORE FOR ENERGY PROGRAM IMPLEMENTATION IN 2015. In the plants, it is exciting to see the work underway. Teams are actively seeking out and fixing air and steam leaks; installing lighting retrofits; improving pipes, pumps and compressors; adding insulation, and making HVAC upgrades. 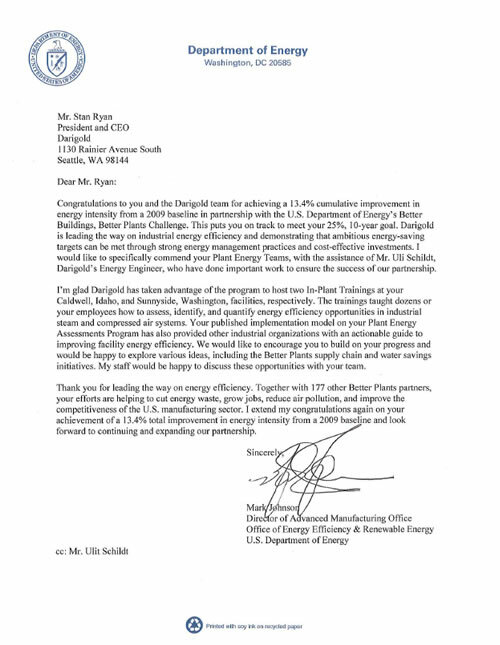 Along with the capital investments we have made toward energy conservation, these efforts have resulted in significant progress toward reducing our energy use and thus our carbon footprint. At the same time, there are a number of issues and challenges that directly affect our energy use which are inherent to the dairy industry. Fluid milk, for example, requires considerably less energy consumption than powdered milk or cheese. As customer demands shift, resultant changes to our product mix can have dramatic effects. Similarly, if volumes for a given line, product, or plant decline, the base rate energy demands remain nearly the same, leading to much higher “per pound of milk” rates of energy use. 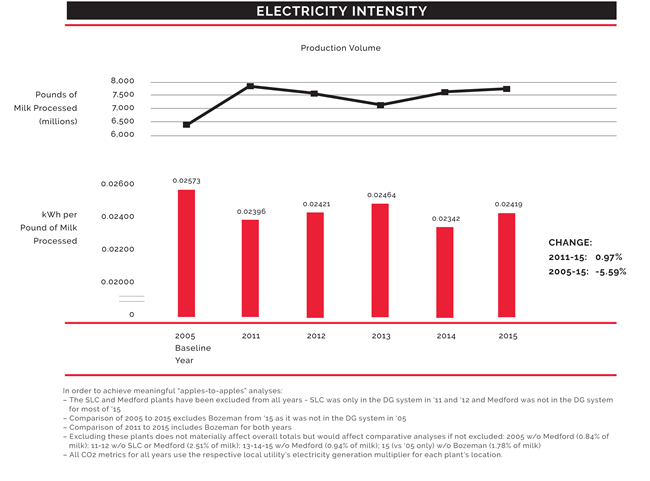 In our Caldwell, Idaho, plant, for example, butter production was down by 50% for some of this 2012 - 2015 time period. Given these kinds of changes in our production mix as well as changes in the milk supply, energy use at Caldwell was more intensive. 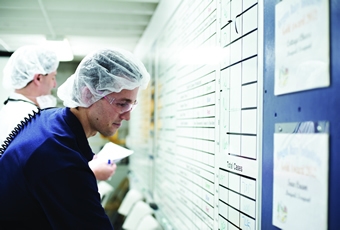 Our Jerome, Idaho, facility has been responding to increased customer demand for very high protein milk powder – which is more than twice as energy intensive as regular skim-milk powder because it needs additional processing through our ultrafiltration processes, and different drying conditions due to the increased protein levels. An additional ultra-pasteurization line was installed in our Portland, Ore., plant, but the production volume has not yet reached full capacity. Ultra-pasteurization systems, however, have to be kept sterile at all times. So at any moment when we are not running milk, we must have hot water circulating through the line – thereby using the same amount of energy despite less production.  Sometimes, product or process improvements – which we are passionate about pursuing – carry additional energy consumption demands. In our Issaquah, Wash., plant, for example, we installed a reverse osmosis system that required an additional 350 horse power of electrical load. 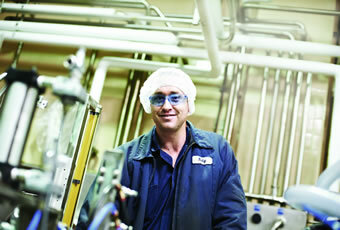 At our Sunnyside, Wash., plant we designed a large expansion in three phases. Phase 2, completed in March 2015 (right after completing Phase 1 of new milk receiving bays), allowed us to make condensed milk. The condensed milk was then shipped to other plants to be made into powder. This required additional handling of fluids at both facilities, and thus additional energy demands. On the flip side, during Phase 2, we reduced the number of trucks on the road by approximately 25 trucks per day. Phase 3 is now complete so the powder is made right at Sunnyside, resulting in environmental and product improvements, but for many months we carried that additional energy use burden. We share these examples and efforts as a way of providing context for understanding our energy and carbon footprint performance. Over the past four years since our last full report, our total volume of milk processed has been essentially constant (down by less than 1%). Both our total electricity consumption and electricity intensity (kWh per pound of milk processed) similarly have been flat (total electricity consumed has been essentially unchanged and electricity intensity was up less than 1%). 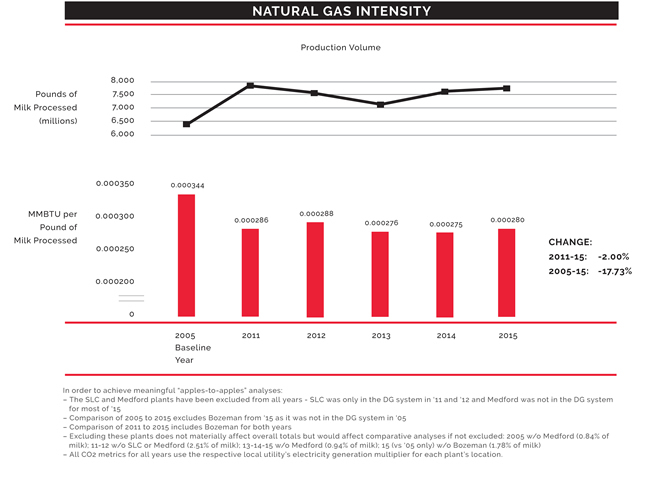 But we have been able to achieve substantial improvements in our use of natural gas: we reduced overall natural gas consumption nearly 3% and lowered natural gas intensity exactly 2%. This led to important decreases of 3.5% in our total carbon footprint and 2.6% in our carbon footprint intensity (CO2 per pound of milk processed). In the face of the product mix changes and the wide variations in energy demand that present challenges across the dairy industry, our steadfast efforts at systematic energy conservation have been paying off. Our water conservation efforts are a bit further behind than we’d like them to be. Similar to our energy conservation efforts, factors such as product mix changes, cleaning and quality requirements, and shifts in technologies can all negatively impact specific results we might otherwise see based on our improvement efforts. In the water area, we are also faced with the challenge of building an effective measuring and monitoring system, and here, the devil is in the details. Some drains, for example, have had no metering system and some plants have multiple water sources not all of which have always been perfectly monitored. We have been working diligently over the past several years to systematically track and meter all of our water use and all of our wastewater and carefully analyze our water performance. 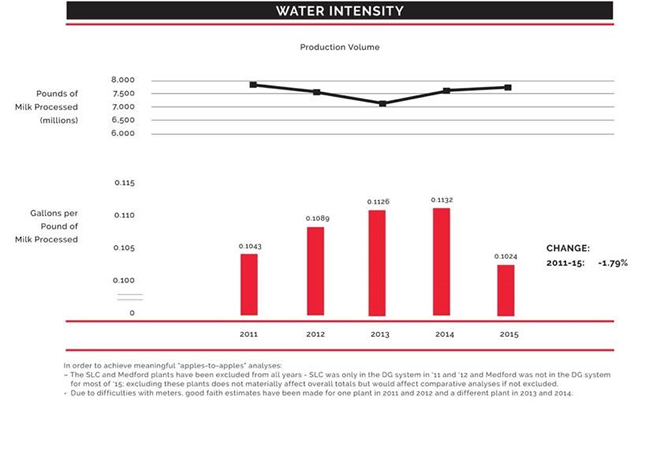 Prior to 2009, we do not have complete data on our water consumption. Since 2010, our water monitoring has been improving, but even in the data we report here on water and wastewater performance from 2011 to 2015, in a few cases we have had to use our best good-faith estimates. 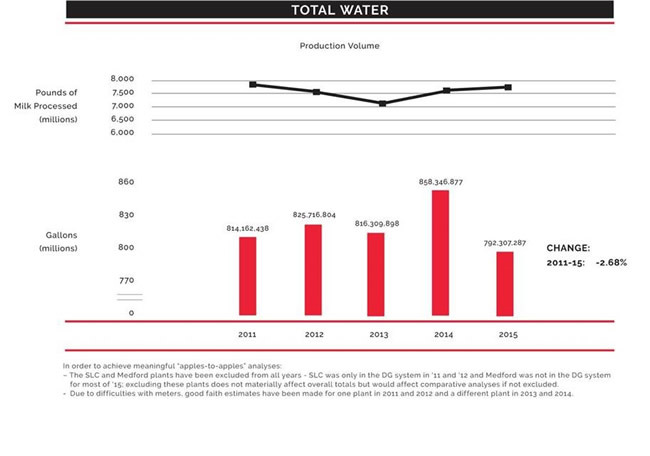 Over the past four years, we have reduced our total water consumption by nearly 3% and our water use per pound of milk processed by almost 2%. Our EHS managers in all Darigold plants have been working to identify and fix leaks, reuse water when possible, and develop process changes that reduce water consumption. These efforts have paid dividends by allowing us to reduce fresh water consumption overall by 2.7% and fresh water intensity (gallons of water per pound of milk processed) by 1.8%. This represents true improvement, as our total product volume was essentially flat over this time period. The results for wastewater were quite different. Total wastewater generated was up more than 14% over the past four years and wastewater per pound of milk processed was up more than 15%. Our experience in the plants, though, highlights that these results illustrate some of the challenges in improving. For example, we obtain “polished water” (water removed from the milk during drying operations and then treated for reuse and certain applications) in many of our plants. More recently, we have been re-using that polished water for various cleaning operations in our plants, an appropriate and innovative approach to water conservation. Once we do that, however, that water eventually makes its way through our plants and into city wastewater infrastructures. 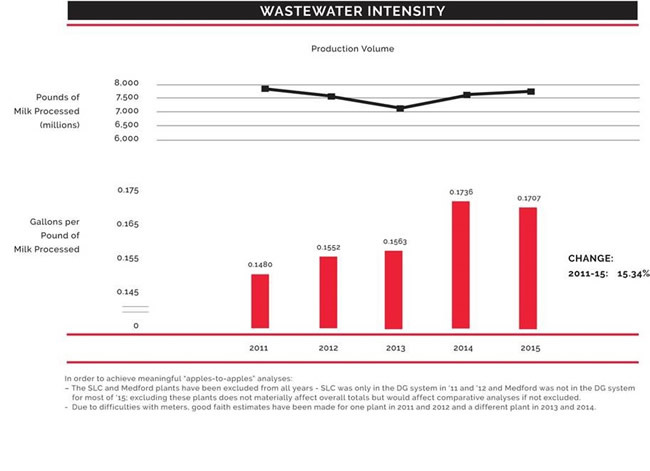 So while we are in fact reducing wastewater generated, our measuring systems did not accurately track all the wastewater in the past and are only now catching up. We are now obtaining numbers (in the past two years) that we are confident are accurate. We look forward to continuing to report on our progress in the future and we anticipate that as our metering and monitoring systems continue to become more robust, the good results we are creating through our conservation efforts will be reflected in lower levels of wastewater generated. 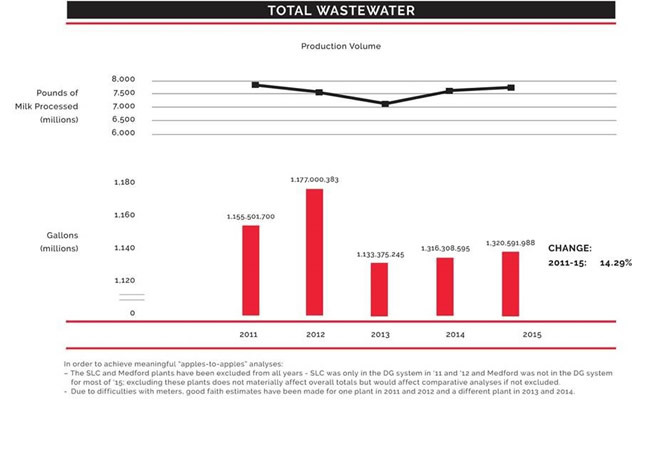 Reducing our waste-to-landfill and increasing our recycling are important priorities for us. Over the past four years, however, we have contracted with recycling and waste reduction vendors to significantly upgrade our improvement program and have been unsuccessful in achieving programs and vendors that have worked well for us. We recycle more than one million pounds of packaging and other materials each month, at a rate that we believe is about 50% of all our waste, but we do not have fully reliable data on this. We are committed to improving this area of our environmental footprint as we move forward.